The respectable Yasodha could tolerate not the shame of Krishna stealing butter from the houses of other Gopas. Her love towards Him transformed into a rope with which she tied Him. This incident of the Lord getting tied by a simple lady has greatly moved the hearts of the saintly Azhwars. Krishnavathara is very special. It is much unlike SriRamavathara. 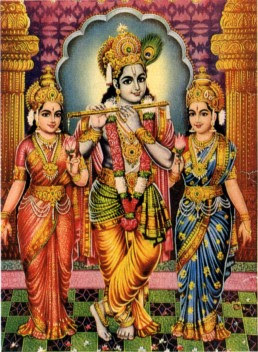 Krishna causes trouble to both the good and the bad. He displays His might and destroys the bad ones. The ones that love Him are enchanted by His divine physical form, His actions, His words and His auspicious attributes. Krishnavathara is the pinnacle of the Lord’s incarnations and the end-point of saulabhyam. The Azhwars are ever moved and also distressed by His actions. They are afraid of what ill would befall the Lord. He seems to have no scruples about His actions. 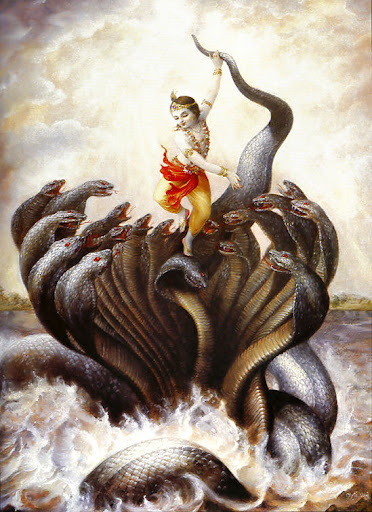 When Balarama is not with Him, He jumps into the mouth of the snake Kaliya. He throws Himself into the ring of wrestlers like Mushtika and Chanura. The Azhwars love Him deeply, and hence are concerned of His well being, as He throws Himself at the demons without a second thought. Our Purvacharyas have explained the reason for Azhwar’s obsession with Krishna, of all incarnations. In Sriramavathara, one need not worry about the welfare of Rama. His father, Dasaratha was the slayer of demons and had many a time assissted the Devas in war. His Ikshvaku clan is the dynasty of valorous kings; the utterance of their very names would strike terror in the hearts of the wicked. The four sons themselves shone with auspicious attributes and were capable of winning over the worlds by merely displaying their superior qualities. The city of Ayodhya(as the name suggests) was impenetrable to enemies. It was all the other way round in Krishnavathara. Nandagopa was an innocent person who knew nothing more than his cows and milk. Krishna, Himself, was born inside the prison of the very Kamsa who wanted to kill Him! 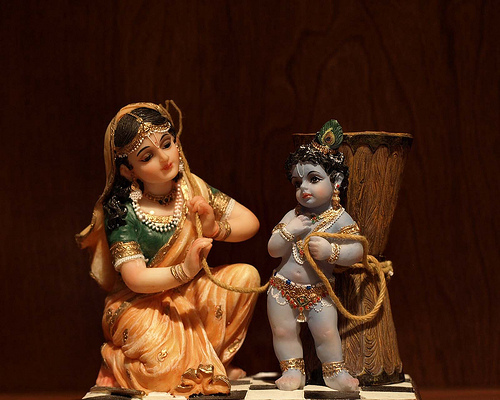 In Brindhavanam or Gokulam, Krishna always found Himself in the midst of trouble, even as a baby. The likes of Puthana arrived when He was only a tender infant. The thought of Krishna’s pastimes pains the Azhwars. They regret that they weren’t present during His time to protect Him from such extra-ordinary dangers. It is impossible for them to speak of Him. Svami Nammazhvar lost consciousness for six months while explaining the Damodara charithram.